The big festive party is set to get into full swing with town and city centres packed with drinkers celebrating the official start of the Christmas weekend. And partygoers are being urged not to go mad on what is traditionally one of the busiest nights of the year for 999 staff. Paramedics are expecting even more call-outs than last Friday between 6pm and 6am when they dealt with around 1,800 emergencies across the North West. “That was a six per cent increase on last year’s Mad Friday and a number which is expected to rise even further this weekend,” said a spokesman for the North West Ambulance Service. 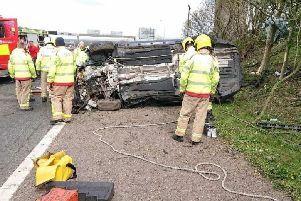 The service is urging people to drink responsibly – and think before dialling 999 so crews are left to deal with urgent, life-threatening incidents. Police say extra patrols will be out in Preston city centre tonight. “We want people to go out, enjoy themselves and would urge them to drink sensibly, however, we will take positive action if necessary against anyone causing disorder,” said a spokesman. Red Cross volunteers will man a nightsafe in the city centre to assist people with minor injuries caused by excessive drinking. The team will also be there tomorrow night and New Year’s Eve. “Nightsafe plays an important role in ensuring that people are safe and well, and don’t end up in hospital unnecessarily,” said Denis Gizzi. Chief Officer of Chorley and South Ribble Clinical Commissioning Group and Greater Preston CCG.